Find the probability of n(A), n(A'), n(B), n(B'), n(AUB) & n(A∩B) for n(A) = 13, n(B) = 4 from the sample space of total events n = 52. The below is the calculation summary for probability of each function such as P(A), P(A'), P(B), P(B'), P(AUB) & P(A∩B) for events n(A) = 13 & n(B) = 4 from total events of experiment n = 52. The below is the work with steps shows how to find the probability of P(A), P(A'), P(B), P(B'), P(AUB) & P(A∩B) for n(A) = 13, n(B) = 4 from the total events n = 52 may help grade school students to solve the probability worksheet problems efficiently. 0.25 is the probability of events n(B) and 0.75 is the probability of not occuring events n(B). 0.08 is the probability of events n(B) and 0.92 is the probability of not occuring events n(B). 0.31 is the probability of both events n(A) and n(B) occur. 0.31 is the probability of events n(A) or n(B) or both n(A) and n(B) occur. 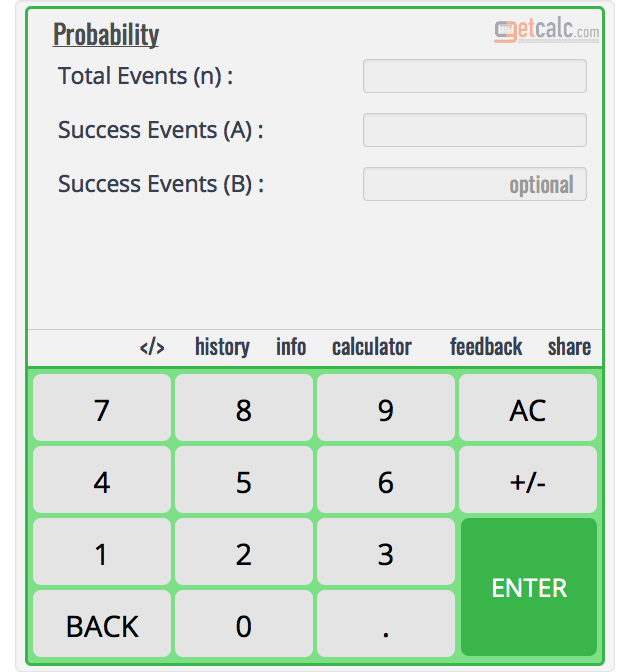 0.75 is the conditional probability of event n(A) = 13, n(B) = 4 and total events n = 52.